You’re right! There is no November 31st! 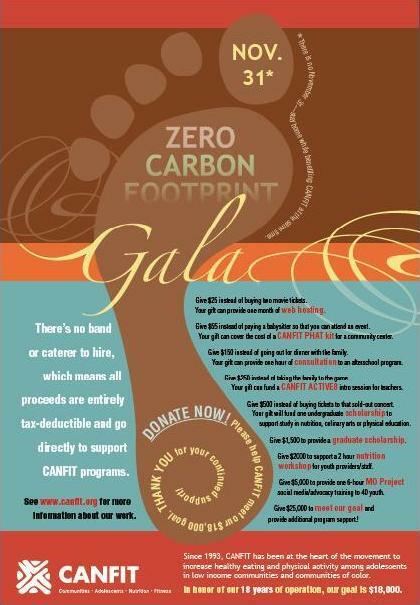 That’s why we chose that date for CANFIT’s Zero Carbon Footprint Gala fundraiser. Why hold a non-event fundraiser? Since there are no costs, 100% of every contribution can go to support our community based programs and services. You can support the work of CANFIT without having to go out on a cold night. Instead, just make a donation! Couldn’t be easier! Plus each contribution is fully tax-deductible – another benefit for you. See your GALA invitation here! Please RSVP with a donation by November 30th. With you taking part, it is bound to be a success! And let your friends know so they can join us too! Also, let us know if you would be interested in hosting a house party or becoming an Ambassador for CANFIT in 2012. Now that you are staying in, you may want to check out this article about what CANFIT is doing to improve the health of all of America’s youth.